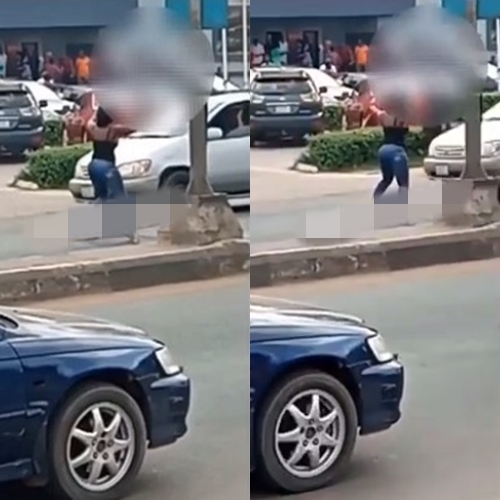 The residents of Egbeda area in Lagos, as well as some bank customers were left in total shock after a lady allegedly 'ran mad' in broad daylight. She displayed 'madness' openly with many watching in shock. An eyewitness shared the story; "This happened few minutes ago at car wash road, Egbeda. "According to sources from the bank, she came to withdraw a large amount of money then after receiving the money she started talking funny and exhibiting strange body movements before she ran outside (well don't know what the security officers were doing). "The cause of her fresh madness is unknown but people are already putting it on yahoo boys (yahoo+) well it might be Benz, it might be drugs, it might be igbo in her head."